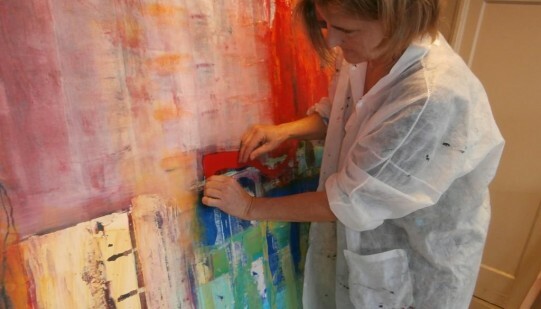 "I started to paint about 15 years ago at the Vrije Akademie in The Hague. Just for fun, no idea that it would result in a career as an artist. Nowadays it is a must to paint, to get my feelings and emotions sorted. My work can be caraterised as intuitiv painting. The Fauvism is one of my favourite periods in the history of art. Beside painting myself I love to give painting- workshops or lessons." "“…..in this respect you can consider her paintings as a kind of visual diary. Allowing you to tear a page out of it and hang it on your own private wall, making it something very, very special and intimate”." "“Most appealing to me in the works of art of Fransje Versloot is the combination of abstractedness and nature. Those who love nature and have an open eye for it will always recognise some of it in the many paintings she produced in all those years. Recognise a feeling, an experience of something personal in the past, while at the beach, in between the pastures or the bulb fields. Her personal abstract style put on the canvas, sometimes subtle, than again with rough paint smears, makes you continue to look for ever”." "“Fransje Versloot works on intuition, from the expansion of the north sea coast to the exuberancy of the cities. Different atmospheres captivated on canvas”. Uiteenlopende sferen gevangen op het schilderslinnen." "“Robust echoes of an inner mood”." "“Recently seen, Fransje Versloot latest work of art. Again imposing, a new direction, if possible maybe even more abstract than her former work. What stands out is her ability to play with light, colour and texture. For the first time she worked with two very large formats 190 by 285 cm, of which her painting called ‘ Egypt’ impressed me much, but the biggest imprint made ‘Home’, a subtile composition of pink and green, faded as if in an early morning dawn. Fransje has been active as a very driven artist for more than twenty years, and it seems as if she reaches a higher level with each new series”." Come and have a look at my paintings at the Douwe Egberts factory in Joure , NL. Or visit one of the events-exhibitions.